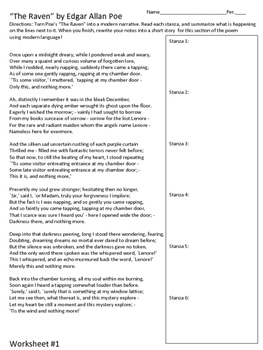 This is a great introduction to Edgar Allan Poe's poetry for your students! 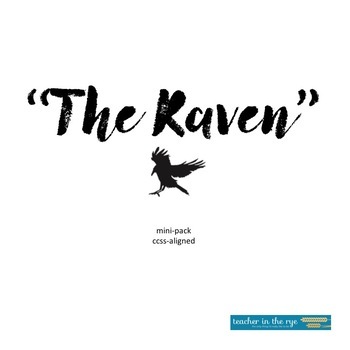 Three worksheets on which students will work in pairs or small groups to paraphrase/summarize a section of Poe’s “The Raven” into a modern narrative. They can annotate or summarize on the worksheet, and on the back, or a separate piece of paper, write out a narrative version of each stanza, almost like a short story! I split the poem up into three 6-stanza chunks because it’s quite long, and would take more than a class period to do. 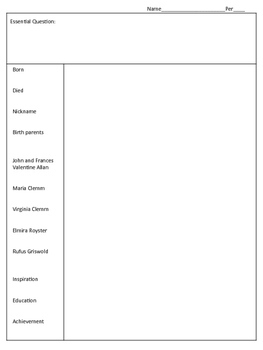 Blank note sheets for use on Poe’s background if you wanted to do a short lecture on him or just have students do their own research on computers or iPads. Figurative language handout that requires students to find examples of simile, metaphor, allusion, and personification. Comes with KEY. The last page is for students to create a little art. Have them decorate the page surrounding the bird, or fill in the raven with words from the poem, or whatever they want! Follow me for updates and new products for your MS and HS classroom!